ENT Carolina patients share their experiences with you. The following testimonial is from a pastor. I am pleased to recommend ENT Carolina and the Phonak family of hearing products. As a result of a childhood disease I have been totally deaf in my left ear for the past fifty-five years. During these years, I lost a considerable degree of hearing in my right ear and was forced to depend upon some sort of assisted listening device. I pastor a church, do a good deal of individual counseling, and also sing. As my hearing continued to decrease, I found myself severely challenged and limited in my ability to fulfill my calling. Over the years I have used quite a few different brands and configurations of hearing aids, none of which really met my needs. About three years ago a friend recommended ENT Carolina. I am so glad I followed his advice and made an appointment. I was initially examined by Luna D. Bailey, MD, and subsequently referred to Lindsey Knuth, AuD. As a result of my tests, Dr. Knuth fitted me with a Phonak hearing aid in my right ear which not only improved my ability to hear, but also performed above and beyond every other assisted listening device or hearing aid I had used in the past. She also told me about a hearing aid for my deaf ear which received the sound on my deaf side (the Phonak Cros), then wirelessly transmitted the sound to the Phonak device in my good (right) ear. At the time, for various reasons, I elected not to go with the Cros. Recently, however, before my semi-annual check-up, I began to consider the Cros as a supplement to my current system and questioned Dr. Knuth about the possibility during my visit. After hearing her description of the technology, and considering the thirty day trial period offered by the manufacturer, I decided to order the device and give it a try. WOW! The day I received the Cros was one of the happiest days of my life! Dr. Knuth set up the Cros, made the necessary adjustments to my existing hearing aid, paired the two devices, advised that it would take a few days for my brain and hearing to adjust to the device, then sent me out of the office into a world of sound I had not heard in fifty-five years. Tears quickly followed! For the first time in fifty-five years I heard birds singing. The laughter of my grandchildren came alive. The sounds in the sanctuary of the church I pastor are now full of the conversations and songs of the saints. I can watch TV in the same room with my wife having the volume at a level comfortable for us both. The hearing aids adjust to background noise in restaurants and other noisy places allowing me to engage in normal conversation with the people near me. I can understand and easily follow the dialog in a motion picture theatre. I no longer strain to hear conversations taking place on the side of my deaf ear, not do I have to work to position myself so that my good ear is always directed toward those to whom I need to listen. I could go on and on about the things I now enjoy as a result of the Phonak Cros system. However, bottom line... the most rewarding purchase of anything at any time I have EVER made! Along with Dr. Knuth I have seen several of the other audiologists at ENT Carolina during my visits, and all have been very knowledgeable, attentive to my concerns, and worked hard to see that my needs were met. I am so very grateful for the care I've received by the entire staff. Without reservation or hesitation I would heartily recommend ENT Carolina and the Phonak family of hearing products to anyone who experiences the handicap of partial hearing loss. My only regret is that I didn't opt for the Cros system sooner. I suppose it's true that you don't really know what you're missing until you find it! My heartfelt thanks to the entire staff at ENT Carolina for caring and going above and beyond the call in vastly improving my quality of life! 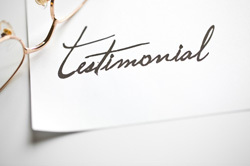 The following testimonial is from a retired physician recently fit for Phonak Audeo Q90 hearing aids. They are working SO GREAT I am in fear they will not always work this good! With my old ones it was always a wonder in the morning if they would come on correctly - especially the left one. Seriously I am truly amazed at how the new ones work. In 48 hours I have not once asked my wife to repeat something she said to me! I have enjoyed watching TV again - in fact, I was hearing it perfectly well at 8-10 feet away and she asked me to turn it up a little! It is an adjustment to hear some of the sounds I never heard before - such as the clicking of the keyboard keys as I type this. I have already made a referral to you - for you to evaluate him and maybe try these with him. "I work in customer service and couldn't hear my customers. I had to keep asking them to repeat themselves. Now I don't have that problem. And I can hear at the movies and don't have to ask for clarification of the dialogue. I can even hear people behind me!"